Features full 3/4 in. 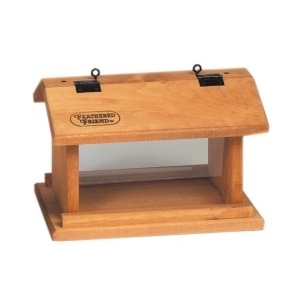 native white pine, non-toxic brown stain, stainless steel hinges and easy- to- clean glass hoppers. 4 quart capacity. Birds can feed from both sides. Easy open top for quick filling. Includes 2 eyes to hang or pole mount.